Needing a rental on short notice? Inquire about specials on any open availability! 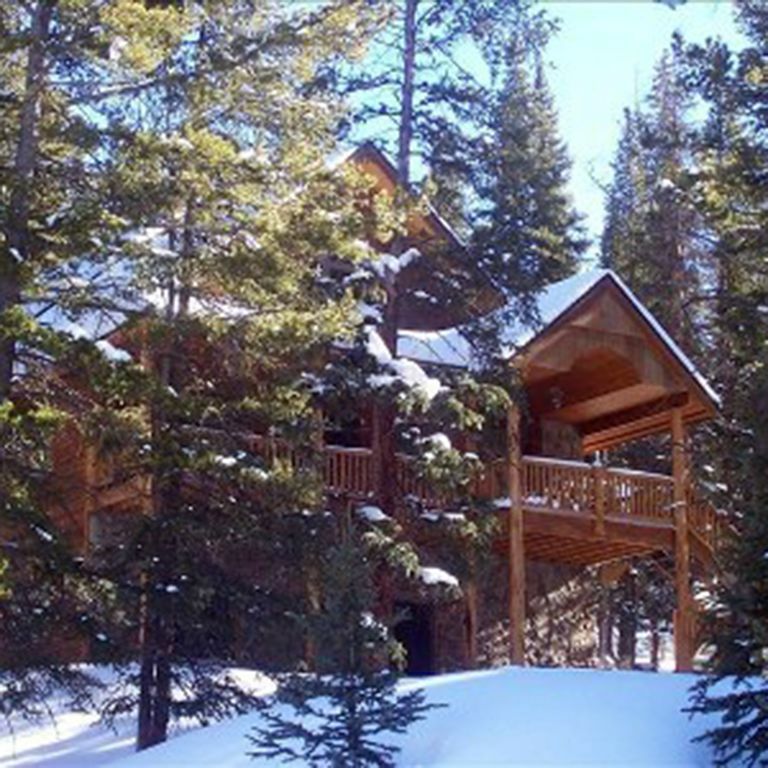 This beautiful, like new, Log-Style Mountain home is great for winter or summer use. It has over 3,000 square feet of living area with all the upgrades like granite countertops, wood floors, and brushed aluminum appliances. There are two remote controlled natural gas fireplaces, Direct TV, and all brand new furnishings on three levels of comfort and privacy. Each bedroom has a private ensuite bath and there are three fold out Queen sofas for extra sleeping guests. Please, No Smoking allowed indoors. NO PETS. There is a Summit Stage bus stop at the Highway 9 turnoff to the house with FREE access to/from ski areas, downtown Breckenridge and other Summit County stops! A two-car garage, fully stocked kitchen, new washer and dryer & refrigerator and plenty of linens will make your stay more comfortable. There are two large decks with wonderful views of the natural forest land and mountain peaks with plenty of privacy as the house sits on 1.6 acres. It's only about a ten minute drive to the town of Breckenridge for skiing, shopping, or eating at their many fine restaurants. There is one large bedroom on the bottom floor with a living area and one large bedroom on the main floor with a living room, dining room and kitchen, and two large bedrooms on the third floor with a landing. Queen sofas are on upstairs landing and in main and basement living areas. Large two person jacuzzi tub in master bath has a window with a great view. There is a shower in every bedroom bath as well. Anesthesiologist in Enid, OK. Married with three adult children. We love Breckenridge because it is so unique and is a great little town full of nice people. It has the best ski area in all of Colorado! Since we are out of town a little ways, we have an abundance of wildlife like deer, moose, bears and foxes visit frequently. It's also a great place to begin a hike around right from our doorstep. There is a Summit Stage bus stop at the Highway 9 turnoff to the house with FREE access to/from ski areas, downtown Breckenridge and other Summit County stops! toilet, tub, shower, Double sinked vanity in tub/toilet area. toilet, shower, jetted tub, 2 separate sinks and vanities. Privacy toilet in bathroom. toilet, combination tub/shower, Double sinked vanity outside of tub/toilet area. 2-car garage and spots for 2-3 additional vehicles nearby. Two comfortable sofas, oversized leather chair w/ ottoman and other club chairs provide great spot to cozy up by the fire while viewing unspoiled views of nature out of the oversized windows. Not all 12 seated at one table, but in the same area. 4 HDTV televisions with satellite. 2 bedrooms w/ TV, 2 living areas w/TV. Poker chips, puzzles and multiple board games. On bottom floor only, not on main floor, kitchen area. This property was great. This was our first time renting a house like this. Some in the group have rented other houses like this before and they said this was the most stocked house they have ever seen. There is literally everything you need located somewhere in the house. We had a couple of minor hiccups that were weather related but the owner did everything they could to get them resolved in a timely manner. The owner responded within 5 minutes of me sending a message which I thought I was very professional. Our group had a fantastic time at the property which is in a perfect location. I could definitely see us coming back in the future. The house was fantastic. We booked the house last minute to ski Breckenridge and it took about 15 minutes to get there but the property made it worth it. Would rent it again. We are all looking forward to returning! We had a Great Time! House is Perfect and so is Karen! Thanks for a Great Stay! The house is top of the line throughout. It was perfect for our group of 6 and could easily accommodate many more. We were there in August and had a blast hiking and going down into Breckenridge. Karen is great to rent from and thoroughly answered all of our questions. The location is great. Just south of Breckenridge by about 5 minutes or so; just before you start climbing Hoosier Pass. We were thrilled with how well the house was kept up and it was spotlessly clean. I mean very very clean! We can't wait to stay at this home again. Hopefully we can get back to Breck soon!! and so was the setting. It was perfect for 10 people. In all the years we've rented vacation homes, we have NEVER had the ammenities that Roger's Roost had to share. The owners go above and beyond the call of duty to ensure your comfort. Our family visited the summer of 2004, and we're looking to go back this winter of 2005. I'm thrilled I was able to find the websight again! Thanks for the kudos. We like comfort and don't mind sharing it.